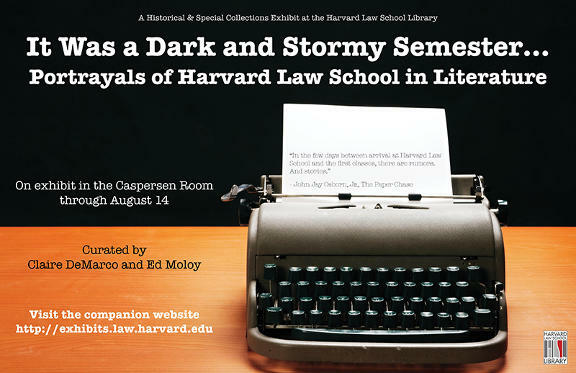 Historical & Special Collections is pleased to announce that its new exhibit, “It Was a Dark and Stormy Semester … Portrayals of Harvard Law School in Literature” is now on display in the Caspersen Room on the fourth floor of Langdell Hall. This exhibit seeks to highlight the role of Harvard Law School in fiction, whether the law school serves as the scene, the featured characters are law school graduates, or even when the law school has inspired its students to become novelists during their JD studies. Curated by Claire DeMarco and Ed Moloy, it will be on view in the Caspersen Room 9:00 am to 5:00 pm through August 14, 2015.